The 65th Oldenburg Winter Mixed Sale will take place at the Oldenburg Horse Center Vechta on Saturday December 8, and will feature a brilliant collection bursting with grace and talent. A total of 37 auction horses have moved into the stables of the Oldenburg Horse Center, training is underway, and these Oldenburgs are ready to be tried as top-class partners for dressage and showjumping – from promising young talents to experienced competitors. Best Girl (Best of Gold x Welt Hit II x Insider) practically floats over the dressage arena with an elfin agility. Her granddam Weinliesel celebrated over 50 successes in medium-level dressage under Erika Schwarzkopf. Hit the ground running and collect the ribbons with this beauty. The four-year old Bordieu (Bordeaux x Depardieu x Le Matin) is an athletic youngster with a bright future ahead of him. The brother of licensed stallion Zonik One (Zonik), he is a prime specimen destined for the world’s great arenas. 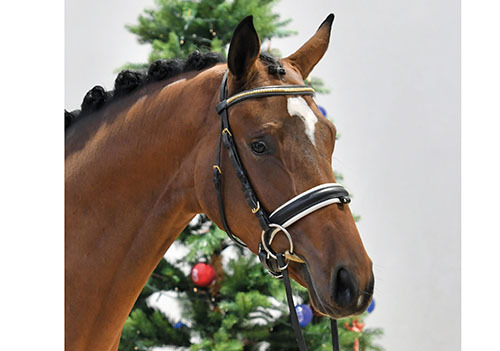 On Friday December 7 at 19:00, the dressage horse collection will be presented to the public in a grand evening show where you'll have the opportunity to see how your favorite performs in a competitive atmosphere.